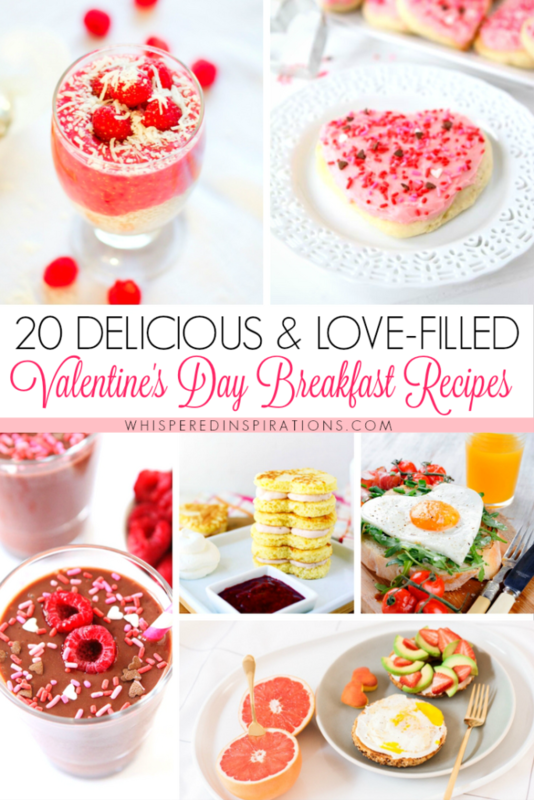 You are here: Home / Recipes / Breakfast Foods / 20 Delicious & Love-Filled Valentine’s Day Breakfast Recipes! It is said that love is that condition in which the happiness of another person is essential to your own. I have to agree and when you happen to find that kind of love, you hold onto it and most of all, you express it as frequently as you can. One awesome and delicious way to express your love for your sweet Valentine is to surprise them with breakfast on the day of love. If you’re looking for some Valentine’s Day breakfast recipes, well, you’ve come to the right place. I’m sharing 20 mouth-watering and super festive Valentine’s Day breakfast recipes that will make your heart melt. Whether you are preparing the surprise breakfast, cooking it together or receiving it, these recipes are sure to put a smile on anyone’s face. The best part is that you are making someone feel special and that’s the entire point of the holiday, right? My favorite recipes to make for breakfast or brunch are my Nutella churros because, well, Nutella is life. What are your favorite Valentine’s Day breakfast recipes? Previous Post: « 20 Valentine’s Day Treats That Will Make Your Heart Flutter! This would be a lot of fun to do with my kiddo. We like to be creative and food is a good way of doing that. What cute Valentine treat ideas! I love that sunny side egg shaped in a heart! I am going to check these all out. I need to find the healthiest one and surprise my husband with it! Can\’t go wrong with eggs and avocados! What a brilliant ideas! This would be perfect on Valentines day! My husband would also love it. I would love to try all of these! Im so excited this coming valentines day! Hope you get to try some! I will check some of these recipes on your list. I might come up with something special for my husband and kids. Oh my goodness, how am I supposed to choose?? There are so many great ideas on this list. Hehe, I do not blame you!